From the title, this should be a very exciting What I Ate Wednesday. You know about WIAW~the food fandango created by Jenn at Peas & Crayons. Be sure to visit P & C when you’re finished here and leave some comments. As I started to say it should be Very Exciting…but it was really low-key, but that’s good sometimes too! 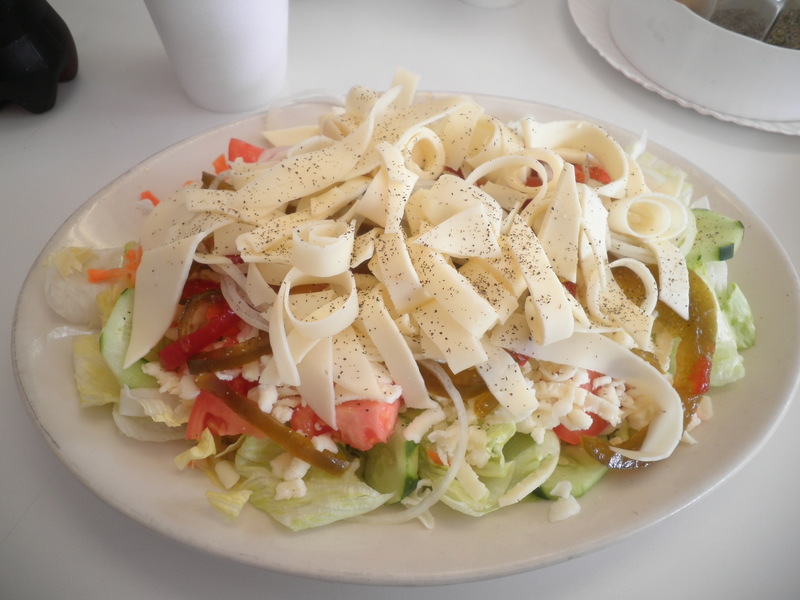 What would WIAW be for me without a trip to the local pizzeria for my favorite…the mixed cheese salad?! You’ve all seen this before and it doesn’t change…which I’m pretty excited about because it’s always Delicious! Saturday after Weight Watchers (where I found out that this weight loss has stuck-in fact I lost another quarter of a pound!) the Three Amigos (Gail, Alice and Me!) headed to the diner for breakfast. 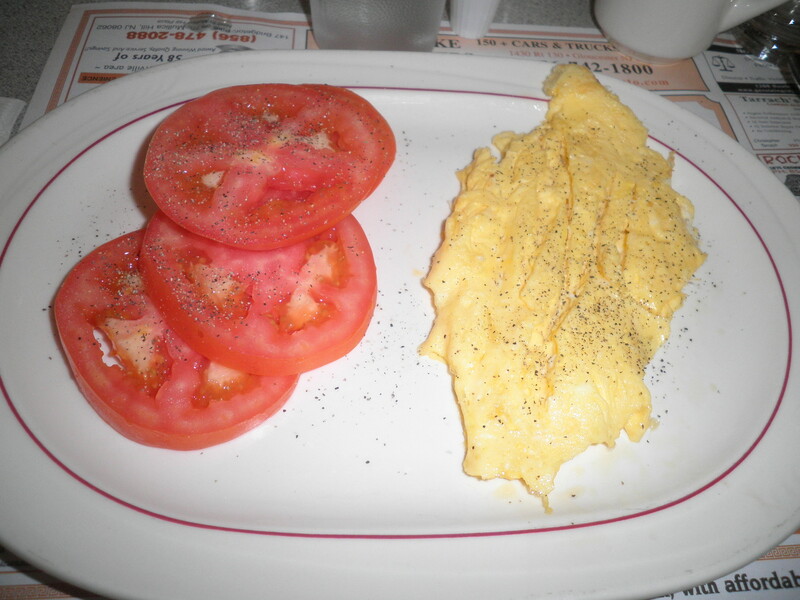 Because of the Holiday weekend, we actually had to wait a bit, but I tried to be good with my scrambled eggs and sliced tomatoes (in place of potatoes) Haven’t had this for a while and it was tasty. Ralph and I actually ended up there again for lunch/dinner. I started with a side salad. It was tasty. However when it came time for my veggie cheese steak that I had ordered, I got a veggie gyro instead. I was so annoyed that I forgot the photo! Now, the veggie gyro is good, but not what I wanted just then. I should have sent it back, but I hate to do that, so I ate it. 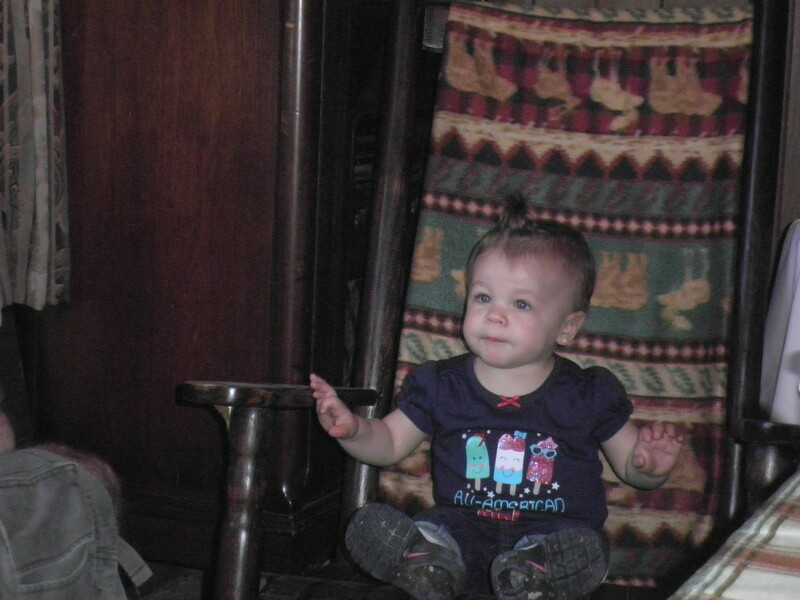 Sunday of the weekend found us at Ele’s house for a get together with Brian and Heather and Princess Colette! She turned One in January and she is so adorable. Love her little sprout pony tail on top!! 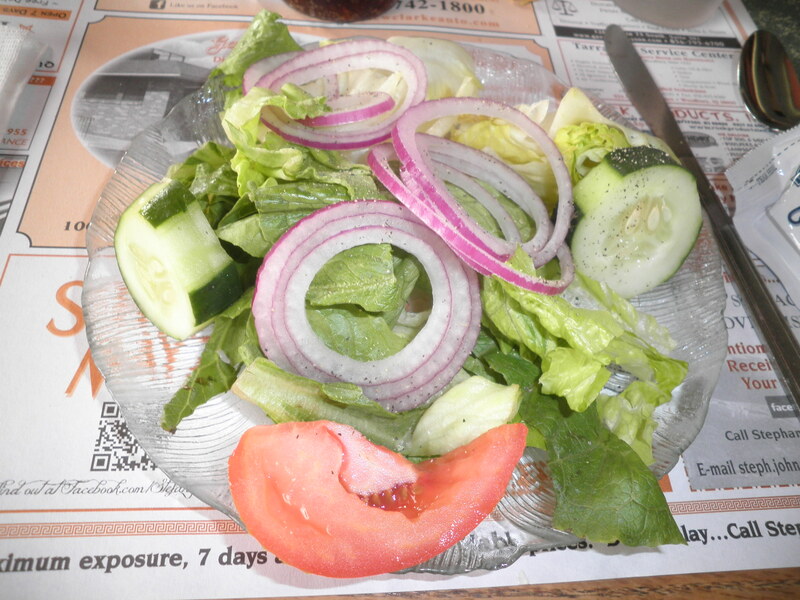 I, of course brought the Big Salad. I made the most of it! There is a spicy black bean burger under there, some extra black beans and an egg, all topped with balsamic vinegar. There was a second dish that looked just like this! Really good if I do say so myself! 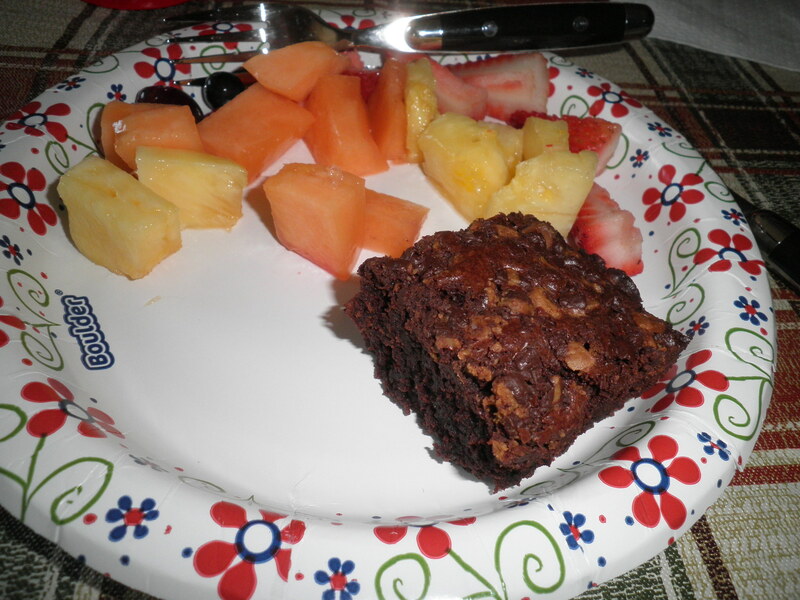 Dessert was fresh fruit and Ele’s famous brownies! I must confess that this brownie was followed by a twin a few minutes later. A little Holiday splurge, but it was worth it! Monday morning I was working hard to get back on track. 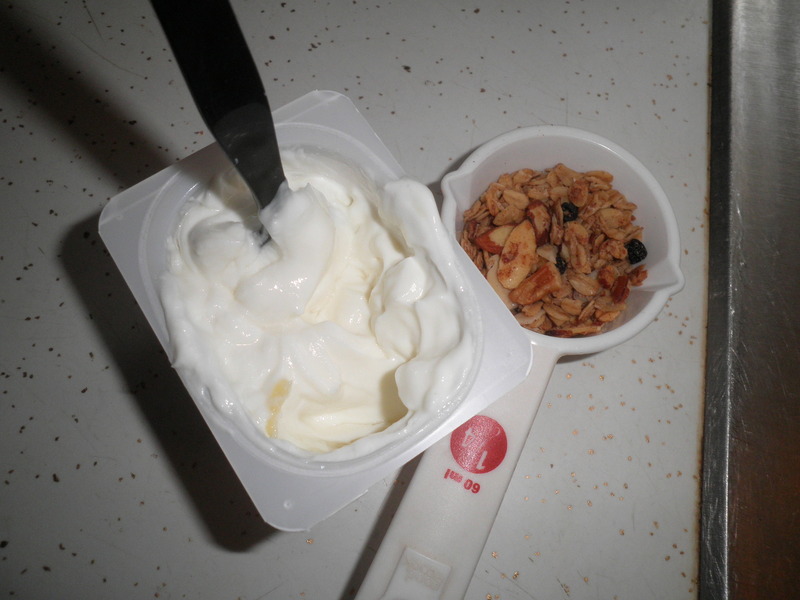 A 2 Point yogurt accompanied by an eighth of a cup of Meghan’s wonderful granola (for another 2 Points.) Gave me a 4 Point breakfast that way and it was really filling. I’m starting to get into this granola thing. It keeps me satisfied. So that’s What I Ate Wednesday for me for this week. Be sure to visit Peas & Crayons to see what everyone else has cooked up this week. That’s where I’m headed now. Leave some comments! 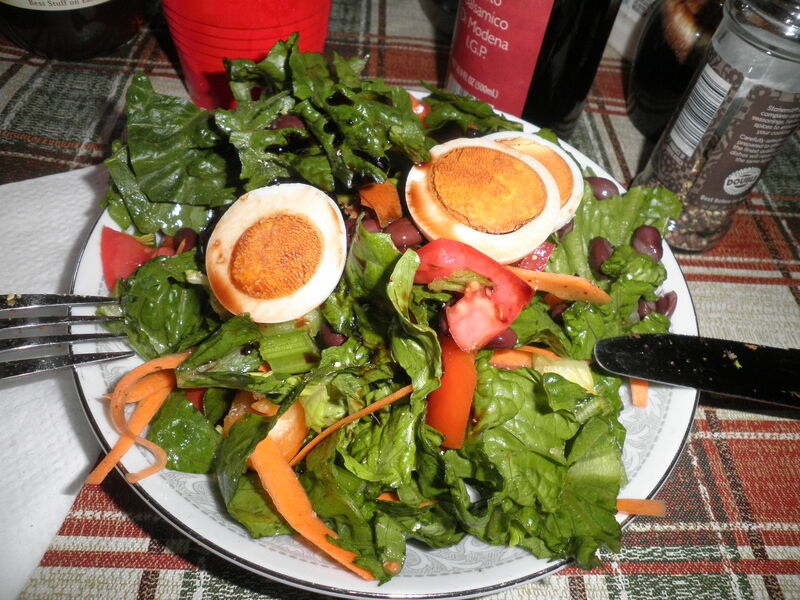 This entry was posted in Uncategorized and tagged Weight Watchers, WIAW. Bookmark the permalink. what a lovely weekend, fran! that is fun that you then went back to the diner with ralph. do you have “your” table, as regulars there?! We tend to end up in the same area and many times the same waiter or waitress! Have a great day, Cathy! Congrats on the weight loss! I think your food looks delicious and very, very healthy. Thanks, Diane! I keep trying!!! Have a great day! i still have to try that mixed cheese salad. looks delicious! Isn’t she adorable. You should see her do “happy feet.” Your heart will melt!! Oh, and a huge congrats on the weight loss! Thanks, Liv! We did have a good time. I was really annoyed. You have a much better reason for sending things back, can’t have an allergic reaction!! Have a great WIAW!! Good for you for getting tomatoes in place of homefries! I have a homefries and greasy runny eggs problem when I go to diners for breakfast. Alyssa, I’ve learned to ask for what you want and be specific at diners. They’re usually willing to do what you want, more so than at fancier restaurants (or chain restaurants) where what’s on the menu is what you get. I’ve been doing the tomato thing for quite a while now. If I feel in need of a little extra protein, I ask for a side of cottage cheese. All of this food looks so good! Love all of the veggies. Ordering tomatoes instead of potatoes is such a great idea! I never would have thought of it. I started ordering the tomatoes instead of potatoes a year or so ago. I don’t need the potatoes, they’re too greasy anyway…thought it was a good substiture. Thanks Alex! Thanks, Laura…especially worth it because Ele makes the Best brownies!! Are those ribbons of cheese? Wow, just wow. I need to try that salad. Yum and sometimes second brownies are worth it. Yes, Meghan…basically they roll the provolone cheese and then make little ribbons of it. Shredded mozzarella is under it. It’s wonderful. I use plain balsamic vinegar on it. Yum…Yes, my sister’s brownies are Always worth a second helping! Have a great day!